Art and science came together on the University of Kansas campus July 14-16, for a summer Ecosphere Studies Workshop with leaders from The Land Institute, KU faculty from the Environmental Studies Program, the Department of Geography and Atmospheric Science, and the Department of Visual Art, as well as select undergraduate art and science students from the University of Kansas, the Kansas City Art Institute, and Johnson County Community College. The Commons hosted the workshop. 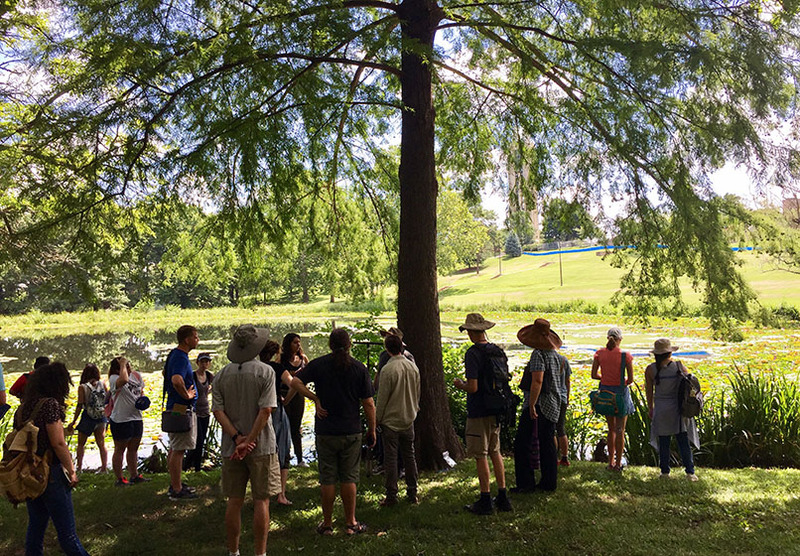 Held primarily on the KU campus, teachers and students engaged with stories and places using both scientific and artistic tools for inquiry, focusing on plants and process thinking. The group also visited the Gorrill Farm Research Station, land just west of Lawrence jointly stewarded by the Malone Family Land Preservation Foundation and the Land Institute. They also explored how future workshops could be taken on the road and offered to a wider variety of participants. KU faculty participants include KU Geography and Atmospheric Science Professor and Chair Nate Brunsell and Associate Professor Dan Hirmas, Environmental Studies Program Professor and KU Vice Provost of Faculty Development Chris Brown, and jointly appointed Department of Visual Art and Environmental Studies Associate Professor Matt Burke. Participating art undergraduates were students of painting, art history, and visual arts education while the science students' areas of interest included atmospheric science, biology, psychology, environmental science, and ecology. For more information on Ecosphere Studies, visit the The Land Institute’s website.